In the Spring of 2014, the Off the Wall Gallery at Dirty Frank’s put out a call for entries to a curated juried show called “BUT IS IT ART?” I felt that I had a number of works in my studio that might fit within this category. I have always collected “found” art, and have recently been making assemblages that utilize ordinary objects: kitchenware, hardware, tools, wire, string, and rope, cigar boxes, and anything else that calls out to me. The “Pure White Lining” piece was made in 2012 as a part of my short-lived 365 art journal. The central fragment of the “SETI” was actually given to me by a neighbor: After taking down his old TV antenna, and breaking it up to fit into a garbage bag, Cory walked over to my driveway with the remaining core of the antenna and said “I think you need this.” It wasn’t until two years later that I mounted the antenna on an appropriate base. Two years after that, the piece was submitted for this show. 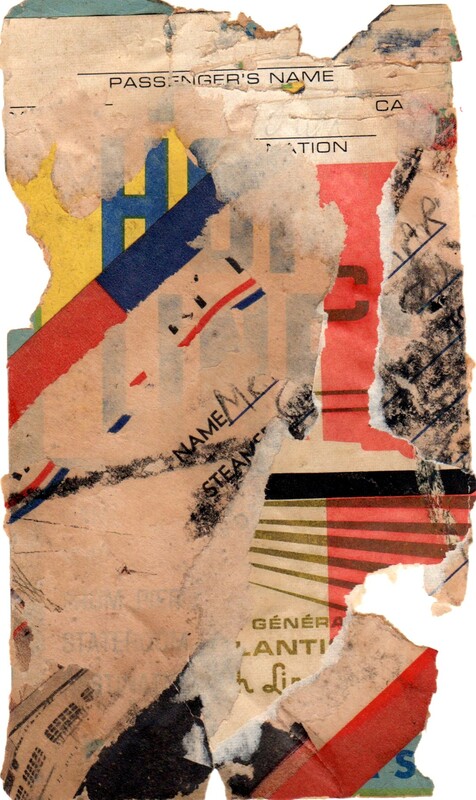 The third piece shown below, “STEAMER,” is a fragment of several layers of stickers and labels that documented the travels of an antique steamer trunk. I found the trunk in a resale shop. The stickers had become loosened, and I liberated the fragment and mounted it on a piece of mat board. This piece of “found art” is very reminiscent of the early 20th century collages of Kurt Schwitters. 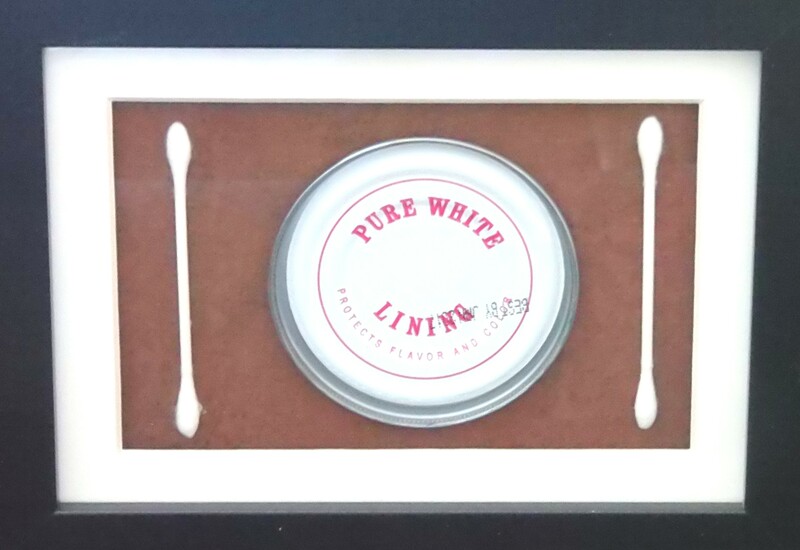 Pure White Living – 5″x7″ mixed media. Art from common objects found in the home. S.E.T.I. aluminum, steel, plastic, wood, stone. 45″ high.